Moving a plan to a different project involves changing the plan's project key (as well as possibly the plan name and plan key), which will also change the build key for all of the plan's build results. Moving a plan does not affect the plan's configuration, nor any comments or labels that have been applied to job build results within the plan. You need to be a Bamboo administrator to move a plan. Note that moving a plan will require Bamboo to re-index all its data, so your Bamboo system may run slowly for a few minutes. We recommended that you back up your Bamboo build results before you move a plan. See Exporting data for backup for instructions. Click Move Plans (under 'Plans') in the left-hand panel. 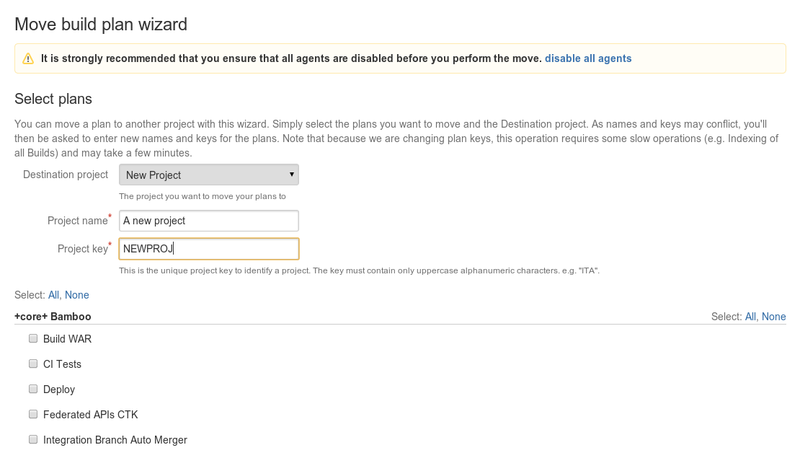 Select either an existing project or New Project from the Destination Project list. For a new project, enter a new Project Name and a unique Project Key. Select one or more plans to move. Click Move to display the 'Configure New Plan Details' page (as shown in Screenshot 2 below). Edit the new name and new key for each plan, if necessary. You may need to do this if the destination project already has a plan with the same plan name or key, or if you wish to change these.